The Federal government this morning arraigned Senator Dino Melaye before Justice Olasumbo Goodluck of an Abuja High Court on grounds of giving false information about the failed assassination attempt on his life in April last year. Dino is being tried for falsely accusing the Chief of Staff to the Kogi stategovernor, Yahaya Bello, David Edward Onoja. 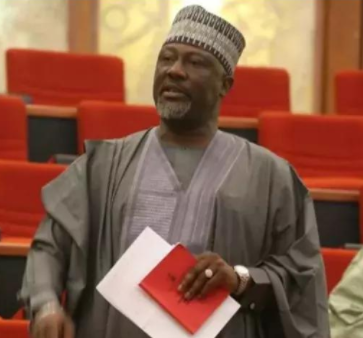 Dino is being arraigned on a two count charge of giving false information about an assassination attempt on his life to the police in April 2017. Senators Shehu Sani and Ben Murray-Bruce were among the senators that escorted Dino to the court. Meanwhile some protesters wielding placards with inscriptions #IStandWithDino; If You Speak The Truth You Die, are currently outside the court staging a peaceful protest. Meanwhile Dino has vowed to fight this case with the last drop of his blood.